Parliament has passed legislation which will see Australia close its doors to asylum seekers arriving by boat. For my part, I’ve been reflecting on what it is about the Christian faith that makes this week’s developments so disheartening for me and many other church members and leaders. It’s not hard to see what’s at stake. We are witnessing not only “grave moral failure,” but also a political process that has completely lost its moorings in the Christian heritage – tenuous enough to begin with – and now drifts like one of the crowded, leaking boats at the centre of this debate, aimless and deadly. Jesus taught his followers to welcome strangers in need. And even more than welcome them, to recognise Christ himself in those people. “I was hungry and you gave me food, I was thirsty and you gave me something to drink, I was a stranger and you welcomed me, I was naked and you gave me clothing, I was sick and you took care of me, I was in prison and you visited me” (Matthew 25:35-36). This bundle of physical, psychological and spiritual neediness is very familiar. It’s right there on our big, flat-screen televisions, as we watch people huddled together on dangerous vessels approaching Australian territorial waters. It’s me, Christ here says to his followers, and I need your help. This teaching of Jesus was itself built on the long Hebrew tradition of extending hospitality to foreigners and other strangers. “The alien who resides with you shall be to you as the citizen among you; you shall love the alien as yourself, for you were aliens in the land of Egypt” (Leviticus 19:34). It was a matter of remembering their own story and also of taking to heart what it taught them about God, who “loves the strangers, providing them with food and clothing. You shall also love the stranger, for you were strangers in the land of Egypt” (Deuteronomy 10:18-19). The prophets drew attention to the same principle in their warnings to the nation: “I will be swift to bear witness … against those who thrust aside the alien, and do not fear me, says the Lord of hosts” (Malachi 3:5). And if compulsorily detaining them in Nauru, Papua New Guinea or Malaysia, or sending them back to Indonesia isn’t “thrusting aside” the stranger seeking asylum, I don’t know what is. These teachings of Jesus, the law and the prophets about strangers and foreigners are examples of an even more fundamental biblical principle. With striking consistency, the books of the Old and New Testaments describe a God whose saving mission begins not with strong, important or even worthy people, but with the stranger, the disadvantaged and the unwanted people and their specific needs. The hope that is offered to them is ultimately the hope of all nations – and, indeed, for the whole creation. But it begins with those who are most vulnerable – whether they “deserve” it or not. So for Christians, welcoming the stranger isn’t just about obeying a commandment but is a concrete way of being part of this bigger story of the mission of God. And conversely, avoiding, ignoring or mistreating the stranger is a concrete way of opposing God – for “just as you did it to one of the least of these who are members of my family, you did it to me” (Matthew 25:40). For all the talk about ending the business of “people smuggling” and preventing loss of life at sea – both laudable objectives in themselves – the specific means adopted to achieve these ends are the same as those explained and justified in the now infamous slogan of the 2001 federal election campaign: “We will determine who comes to this country and under what circumstances”. Strangers are not welcome here, only guests. The freshly stated policy goals are based on a theory of deterrence. The aim is, effectively, to punish new arrivals so that when others hear about it they will be deterred from attempting the same thing. The horrifying message we are sending is that, not only are strangers not welcome here, they are risking further harm at our hands. This is wrong enough in itself. But the pitting of one group of disadvantaged people against another is shameful. 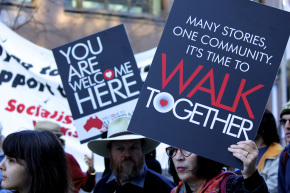 “I was a stranger and you welcomed me.” The reasons for the dismay of the Uniting Church over the outcome of the Houston Panel report are not mysterious or complicated. Jesus said it. We try to do it. And we are deeply unhappy when the governments who represent us adopt policies that punish rather than welcome the stranger in need. As a church leader I don’t presume to endorse one particular public policy as the most effective in delivering the hospitality to strangers that Christ commands. That’s the particular skill and responsibility of politicians. But it would appear that – with the exception of the very welcome recommendation to increase Australia’s annual refugee intake – current policy development is not primarily directed towards helping strangers in need at all. On the contrary, all the political energy is devoted to eliminating one kind of appeal for asylum by making an example of any who attempt it. As a church leader it is my job to say that this is wrong. It is unworthy of us all as human beings, and it is especially unworthy of those of us who would follow Jesus. A nation that is so determined to turn strangers away – to oppose the God whose mission begins with the stranger, the disadvantaged and the unwanted – cannot prosper in any way that matters. This article was first published on the ABC Religion website. Next Who’s the head of the church? thanks for your prophetic and compassionate comments on the Asylum Seeker issue. I thought them excellent. However I do have an issue with the first two sentences of the second last paragraph where you say it is not your task as a church leader to endorse one particular public policy. Presumably at this point you speak on behalf of the church? And does this suggest the church does not have a view on this vexed and complex issue except to say what we do not like and what we oppose? I anguish over this issue but the prophetic compassion of Christ has to be found in the positive specifics of policy or we are just playing the game of opposing what we do not like. That is too easy. There are people of compassion who disagree on this, no-one has a mortgage on compassion and we as church do need to say what we want to see happen and enter the vigorous debate and argue and justify our policiies. God is found in the particulars – of public policy – or not at all.